There’s a commonly overlooked component of your air conditioner that you should probably be paying more attention to. At least, if you want your cooling system (and heating system too, if you use a forced air heater) to operate efficiently and effectively, you’ll pay attention to this component. We’re talking about your ductwork! Some parts of your air ducts may be easy to see—perhaps they’re exposed in an area of your attic. 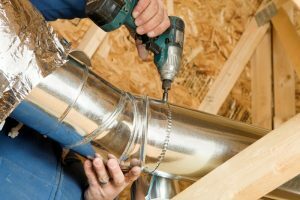 However most ductwork is hidden behind walls and in crawl spaces, and it can be a bit trickier to discover repair needs. So how do you know when something is wrong, and why does it matter? We’re talking about dents or punctures. If you can see your ductwork or access it easily (which is rare) you may be able to spot these breaches. But most are less noticeable. You might have pinhole leaks in your ducts that are letting conditioned air escape. In fact, you might be losing as much as 30% of your conditioned air—which you are paying for anyway. You can likely understand why this is a problem—it’s a waste of energy and money. But before you try to repair it on your own with a bit of duct tape, remember, duct tape is not actually named properly and should never be used on HVAC ducts. If there is restricted cool air in your home, or hot spots throughout your living space, your ductwork can certainly have a leak somewhere. Another possibility is that your ductwork is blocked somewhere, perhaps by vermin that have infiltrated the air ducts. Hot spots definitely indicate something is amiss, so even if you’re unsure if your ducts are to blame, it is a good idea to call our technicians. Hot spots could also be caused by a misplaced thermostat that’s incorrectly reading the temperature, or an air conditioner that wasn’t properly sized during installation. When ductwork is leaking conditioned air, naturally not as much air is going to be coming through the vents into your home. As such, you aren’t going to be as comfortable as you should and you’ll probably turn your thermostat down. Unfortunately, your air conditioner is going to struggle to bring the temperature down to your desired level, since conditioned, cooled air is escaping into areas other than your living space. This means the air conditioner will wear out faster than it otherwise would, which can leave you facing repair needs and even a potential premature breakdown. This doesn’t necessarily mean your ductwork is damaged per say, but it can certainly mean that there is dust or dirt buildup within it, or even the development of mold and mildew. The problem with our summer weather is that it’s humid, and that excess moisture alone encourages bacterial growth. If you notice this, it’s time to consider professional duct cleaning, to avoid illness from such problems. It may also benefit you to invest in the installation of UV germicidal lights to eliminate this bacterial growth at the source. Trust in Shavitz Heating and Air Conditioning for your Chicago air conditioning repair needs. Contact us today!